H.E.S. J-350 14’’ Engine lathe with taper attachment, threading, s/n 1545. Webb Takisawa TSL-800D Engine Lathe. 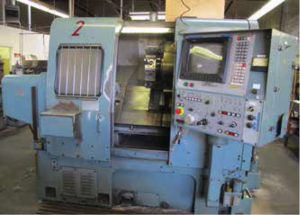 Mori Seiki SL-2B CNC Lathe, w/ Fanuc 6T control, 12 Station Turret, 10’’ Chuck, s/n 383. Mori Seiki SL-3H CNC Lathe, with 10’’ Chuck, 12 Station Turret, Fanuc 10TEF control, s/n 4452. (1 of 2) Mori Seiki SL-3H CNC Lathe with Fanuc Control, 10’’ Chuck, 12 Position Turret. 2) W & S no 3 Turret lathe, 6 station turret. 2) H.E.S. model TS-3 Auto Turret Lathe, s/n 1018.